We Are Often Asked.....What Are HVAC Systems? 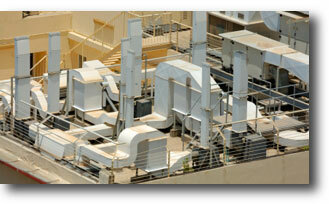 HVAC refers to an air system for heating and cooling in a commercial or residential building. The various components of HVAC systems include a heating furnace, a blower motor assembly, an evaporative coil, a compressor and compressor coil, and the associated air ducts to distribute air within a building. HVAC systems are designed to control humidity and circulate air in a building. There are various types of HVAC systems and equipment used in commercial and residential applications. Some factors to be considerered in the design of HVAC systems include the flow rate and air pressure for the ventilation system. The air velocity and air pressure in a duct system is regulated by the duct size, duct type, fan size, fan velocity,grills, registers and air flow dampers that control air flow in the HVAC ventilation system. HVAC Sheet Metal Estimating or HVAC Ductwork Estimating genarally refers to the material and labor cost estimates required to construct a heating and cooling ventilating system. All aspects of material and labor cost are itemized to determine the total cost estimate for the HVAC ventilating system. A comprehensive bill of materials based on specific design criteria and specifications for the HVAC system are produced with the associated labor cost for manufacturing and installing a system in a building.